The AA Similarity Theorem states: If two angles of one triangle are congruent to two angles of another triangle, then the triangles are similar. Below is a visual that was designed to help you prove this theorem true in the case where both triangles have the same orientation. 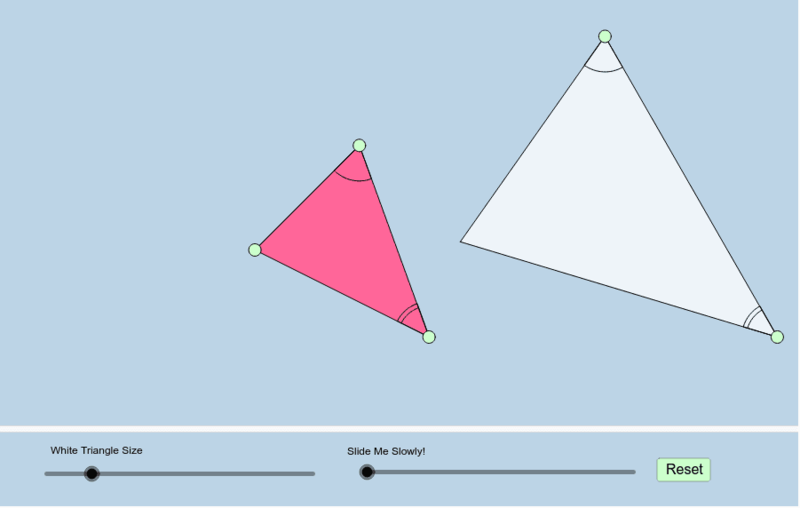 (If the triangles had opposite orientations, you would have to first reflect the white triangle about any one of its sides first, and then proceed along with the steps taken in the applet.) Feel free to move the locations of the BIG GREN VERTICES of either triangle before slowly dragging the slider. Pay careful attention to what happens as you do.